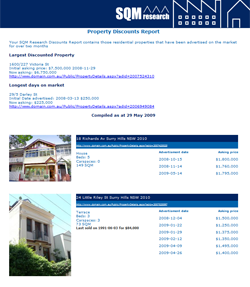 Search for discounted properties | Sample report | FAQ | My reports | Order your report now ! The first page of your SQM Research Property Discounts Report is presented below. On this page you can see the most discounted property in the region, the property that has been on the market longest, and three (of many) properties currently on the market along with a listing of all price fluctuations since the property was listed. The SQM Research Home Discounts Report lists details on those properties currently advertised online, that have been listed on the market for 60 days or more. The report will help you in your real estate negotiations and understanding on how the market is currently trading in any postcode in the country.